No, it wasn't just the ill-chosen socks and shoes for the 2013 tour. Somebody really doesn't like Billy Joel! Yep, Mr. Joel apparently didn't manage to get this one fan feelin' all right. Too bad for the Piano Man but not too bad for me, who landed this week's contribution to the Friday Fictioneers just the way it are at 19 words. Check out the the other Fictioneers by clicking right here; all of them are entertainers who get it right the first time and will no doubt get you high tonight. So, don't make me wait! Think this post was something of a cheat? Keep it to yourself, it's my life! Thanks, Rochelle. For the record, I once liked Billy Joel, not so much anymore. But I'd never do what this one fan did! Thanks for the comment, Sandra! You've got me feelin' alright. You're welcome. Liked your post as well. Best wishes to you, Perry. Poor us that have to listen to his played-out music after all these years! Not a big Billy Joel fan, I'm afraid - I just remember seeing him in that 'Uptown Girl' video and being amazed and horrified that he was with that gorgeous model! And that song got played to death on the radio here, so I might well have shoved him through a piano back then! Believe it or not, Billy Joel was kind of good-looking as a young man, with a full head of bushy black hair. http://bit.ly/ZM36II He has aged about as badly as anyone in show business, and certainly worse than I have! (ahem ... ) So why don't I have a gorgeous model? Ahhaa! I actually heard Billy Joel in a radio interview a couple months ago and I was laughing out loud. He is really funny too -- maybe that's the reason for his "outfit." Oh Perry, i have never thought of registering my displeasure with a musician in this way. Listening to music on my Windows Phone as i take care of gardening needs I simply bump ahead to the next song when I hear the beginning notes of an artist I disfavor. 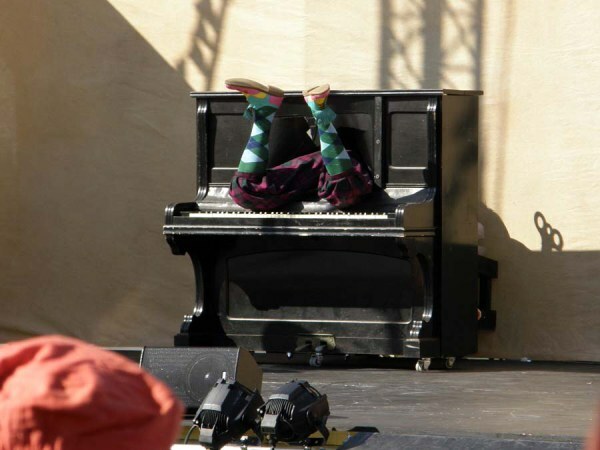 Yes, and you gotta admit he looks great stuck halfway in a piano in those shoes and socks! C'mon, you've given some thought to hitting him or her with a rake, haven't you? I hope you're right, but then this must come as close to cheating as there is! Thanks for commenting. I don't know how clever, but glad you had fun! Ooops! You're right. I'll fix it. You don't fool me with this Billy Joel stuff. The reason your story is so short this week is because you can't wait to get over to the golf course and keep the hot, young girlfriends of those millionaire golfers entertained while their men are chasing a little white ball around a pasture. Damn, I wish I was there! I'd answer, but I'm over at the golf course now doing exactly what you said. And not a word wasted - loved it! I don't hate Billy Joel at all, just kind of sick of most of his incredibly played out music. I loved him just the way he was, when it wasn't. Thanks. Some would say every word wasted. Thanks, but I don't do snippets any more! Well, after all, he is The Entertainer! Wow. You could tweet your entry in. You know, I could. And still have room for a cite to the picture prompt! Great 19 words.. but are you sure you can use the remaining 81 in next week's story? The Friday Fictioneers is an interesting group you're part of. Keep up the snippet of wording Perry. I may not comment on everything lately (I do have a life you know!) but I do read and "Big Sister" is keeping an eye on you!! Pretty sure I can't, you're right. If anything, I'd love to use all the remaining comments on some of my regular posts, which get only two or three at best. How do I work that one out? Smile and the world smiles with you. Thanks! I've been meaning to talk to you about giving up that life, Libby, because I need lots more comments on the regular posts, but not today. Maybe later in the week .... Thanks!